" I have decided to stick with love. Hate is too great of a burden to bear. " - Martin Luther King, Jr. I think it is pretty obvious by now that black is my favourite color. My wardrobe is pretty colorful but I tend to lean onto black outfits a lot ; black is slimming (wait...is that a fact or a myth?) Anyways, for this outfit post I have on a peplum top with beautiful detailing on the shoulders. 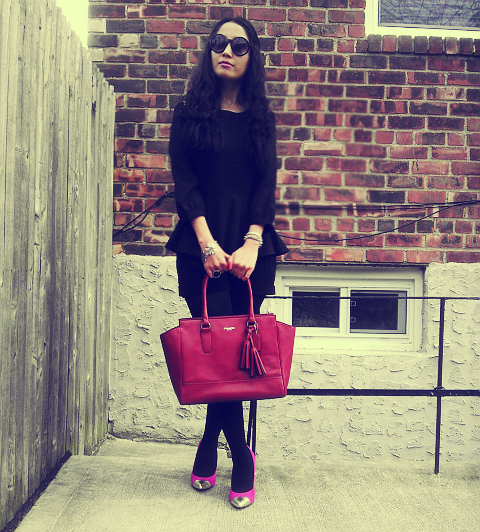 I paired the peplum top with black shorts, black tights and fuchsia cape- toe pumps with black cherry Coach bag. Black is my favorite color for clothes too. Black looks always good. Beautiful shots, the basque wonderful ... ! I really love that peplum top on you! Looks gorgeous! Amazing look.... 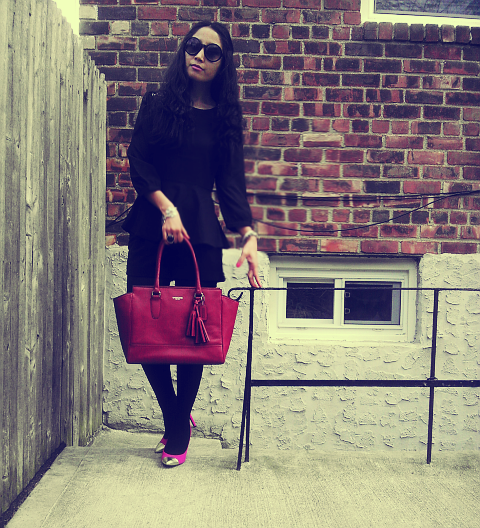 I love the touch of color of your pumps and your bag!!!! I love peplum top! Great bag! Perfect color touch!! :) Love those shoes! AAAAA! THOSE SHOES!!!!!! They are amazing. You look darling sweetie! 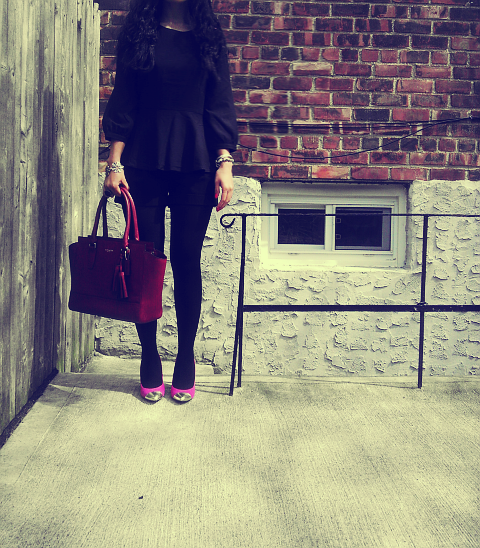 Love the puplum and your stunning shoes! 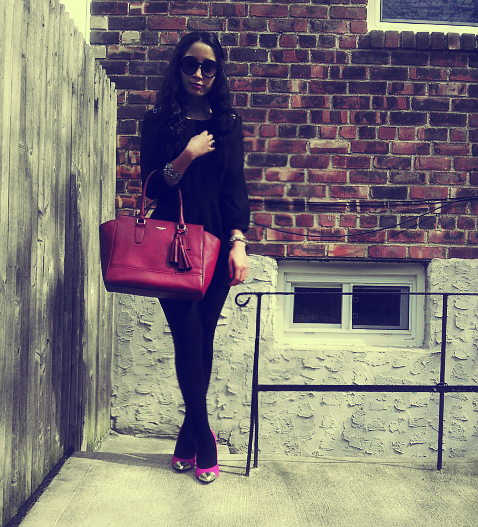 Nice classic look dear and I love how you broke the total black with that stunning bag! Okay.. first I LOVE BLACK. It is totally the color I go to all the time... but I always have to stop myself, otherwise I wear it way to often!!! Second... 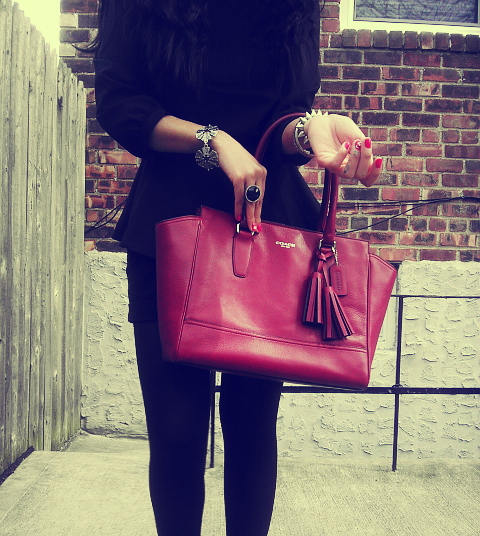 I am in love with this whole look... the coach bag.. NEED IT.. and your shoes... perfection! I love your style , don’t worry love, we can wait. do you check out my blog? i’m new in this. Could you give me some advice? gotta love black! totally chic outfit and LOVE the bag. Great outfit and cool pictures!! Love your blog by the way - you have a new stalker! 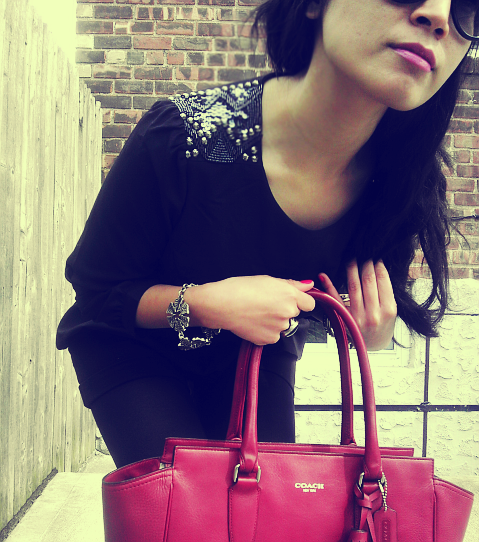 Realy love the colour of the bag. Check out my J'adore Dior giveaway! Great bag and shoes ! Love the blouse with the beautiful detail on the shoulders! Such a cute look:)! 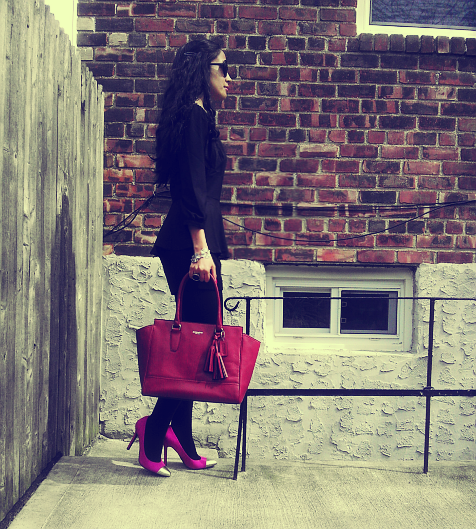 The pop of color from the bag and heels is perfect! lovely look, that bag is amazing! Oh I love the whole outfit. The pumps are just stunning. Love this post! Beautiful look! Thank you so much for coming to me! Check back soon to see me on Inside Me! that top is gorgeous ! Es un look precioso,perfecto y elegante. I love how flawless your outfit is! And there is so many good details about it that I can only say it's perfect! I think my crush is on your peplum item of course! Have a great day darling! Hi, thank you for comming by again sweety!